From the first scene of Kendrick Lamar eating corn on the cob in a palm tree, we knew we were in for a treat. The new video for “King’s Dead” has debuted, just in time for Black Panther’s theatrical release—the song appears on Black Panther: The Album. 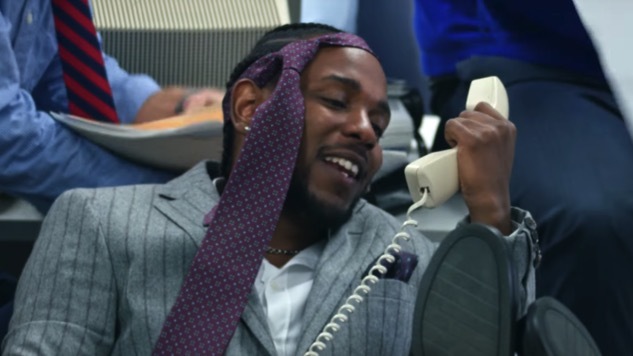 Lamar is joined by Future and Jay Rock in the music video for the song featuring James Blake, doing everything from trading stock in a Wolf of Wall Street kind of way to playing craps in front of a liquor store and rapping on top of palm trees and office buildings. Directed by Dave Free (of the little homies) and Jack Begert, the music video features a lot of fast-action camera work, at times visually taking us back to 1999 with a VHS filter, and even going POV for one particular scene in which Lamar brawls with an unknown character. The “King’s Dead” music video follows the “All The Stars” video, which has recently caused some controversy when an artist accused the video’s creators of stealing her work. Watch the “King’s Dead” video below in preparation for Black Panther, in theaters now—you can read our review of the movie here. Then, stream Black Panther: The Album in its entirety here.